40V Attachment Capable 10 IN. Pole Saw is rated 4.7 out of 5 by 73. Rated 5 out of 5 by RJM1195 from Easy to for me to use First of all I am a handicapped person, an amputee of both my legs below the knees and both hands at the wrist. I own a gas powered Echo that I can use but only if someone starts it for me. 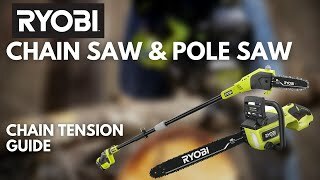 With this Ryobi being a cordless electric pole saw I no longer need anyone to start the unit for me, I can do it all myself. It is just as powerful as my gas powered Echo and just as easy to use. We own 2 acres of land and I use it to clear away limbs, underbrush and small trees. It gets the job done. Rated 4 out of 5 by Blairwitt from Strong saw, very capable I have a Minnesota Lake home with 75 large oaks, maples, basswoods and Pines. I’ve had a hand held pole saw but it’s a lot of work and too much flex to apply any pressure. Purchased power head refurbished separately and saw from Home Depot. Tried it out today and am glad I’m a little strong as the saw is pretty heavy when you add the 40V battery. However, it cut 3” branches like a hot knife through butter. I like it! 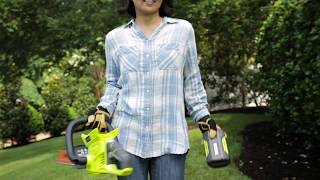 Rated 5 out of 5 by Edward8279 from I no longer put off trimming my palms I really hated trimming my palms, Washintonian, also called petticoat palms, this tool, made that job super easy and fast. I do advise reading the owners manual and actually doing what it says.." Wear long pants and long sleeve shirt, I did not and one of the palm fronds barbs immediately became lodged on my arm..not fun..either way .. I lived..point is this.. this machine is great, however I have the 10 foot extension version, and the machine doesnt seem to work with the extension. I will retry it soon. Rated 5 out of 5 by Timbo 58 from My First Ryobi Cordless Trimmer I spent nearly two hours in Home Depot reviewing all the brands and features of every cordless string trimmer they had in stock, and for the price, features, and the biggie for me was the warranty, I chose the Ryobi 40V Lithium.It was easy to assemble, is rugged, and the Lithium Battery charges fastThey offer a 90 day trial and a 5 year warranty on the trimmer, and 3 years on the battery. Rated 5 out of 5 by Angela01531 from Great Tool! This has been the handiest tool my husband has bought in a long time. He is experienced at using a chain saw and cutting down large trees and clearing branches around the house. This has made many of his jobs so much easier and faster. 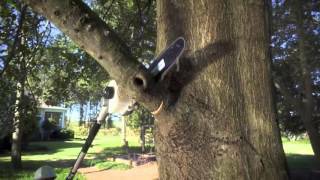 He can reach places that he could not before and clear branches, making it a lot safer to remove the larger branches with the chain saw. Rated 4 out of 5 by 1thirdacre from Good so far Good pole saw. Could have some improvements though. Chain guard is made of plastic and chain tension is built into the plastic guard. When cutting limbs with any greenery or small twigs around they get pulled into the plastic guard and get bound up and you have to remove the plastic guard to clean out the twigs etc. Only 2 screws hold it on also. I see this as a weak point because the plastic guard is not rigid and could break which renders the saw useless because you can't tighten the chain. As I have seen in other reviews about this saw, you need to have the chain spinning full speed before trying to cut. Chain is sharp and has stayed sharp after after quite a bit of cutting. No problem cutting through 4-5 inch limbs. Haven't tried anything bigger but would probably do fine with some patience. Gas-like power you want, attachment capability you need. 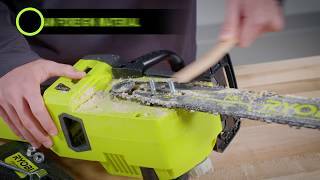 The Ryobi 40-Volt X 10 in. A Pole Saw features a 10 in. 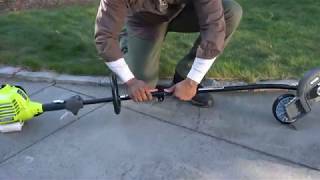 bar and chain that is ideal for pruning and cutting limbs up to 8 in. thick. Reach dead branches or overgrown limbs up to 12 ft. above the ground with the included extension shaft. The angled trimming head allows for user control and more precise cuts. An automatic lubrication feature helps keep the attachment well-oiled during use. 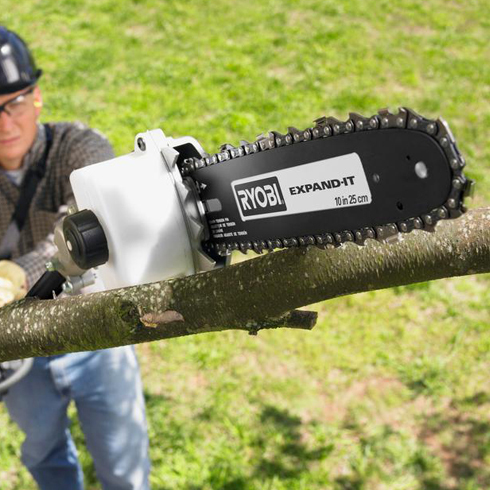 Attachment capability means you can add on Ryobi Expand-It attachments, saving you time, money and space. Includes extension shaft for extra reach up to 12 ft.
Bar & Chain: 10 in. Cut Capacity (diameter): 8 in. Length: Adjustable 9.5 -12 ft.